Growing up around water, I have found the element fascinating. When I was given the opportunity to review some scientific items from Educational Insights I was grateful to share my passion with my kids. From the large creatures that swim to the tiny organisms that keep everything balanced, the water is place of wonder. I want to foster that love of water and all it holds to my kids, which is why we have the Nancy B's Science Club AquaScope and Underwater Activity Journal. 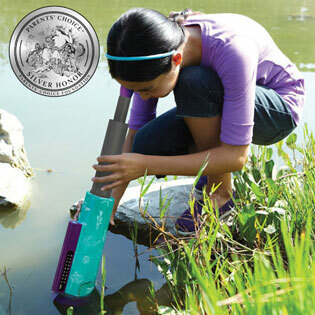 The AquaScope is a great way for kids to explore water. Kids think about water as a play element. For example, playing in the water fountains, swimming in a pool or jumping through a creek. But, water is so much more. With the AquaScope kids can see what is living inside the water they enjoy. With 5x the magnification power, the AquaScope can show the living organisms that we can't see. Not to gross anyone out, these living items are vital to the environmental balance. Thanks to the LED light, kids and clearly see what's swimming all around them. To expand your child's thinking, the AquaScope comes with an activity journal and experiment suggestions. Nancy B's Science Club AquaScope and Underwater Activity Journal can be purchased at the Educational Insights website for $34.99. Expand your child's appreciation of the planet's vital elements with the AquaScope from Educational Insights. I LOVE this idea! My son would love this for his bday! Oh that has to be the coolest thing ever! I think both my little one (3) and teen would both like this! What a cool (and unique) toy!! My son would love this. I will have to pick up the AquaScope and activity journal for him for Christmas.